First item up is a post about Charles Johnson’s belief that the Tennessee state flag has some neo-Nazi elements. I kid you not. On the other hand, maybe Chazzer was just trying to get some attention and by Thursday it will all be “April Fools!”. CJ has done stranger things. Give me a week and I'll think of one. NASA climate data is even more questionable than “the besmirched Climate-Gate data”. Hey, that means we’re even worse than the UK professors because our blunders weren’t purposeful. Just more government keystone cops bureaucracy in the US but the wily Brits, they were the real deal. Clever and evil instead of merely hapless. That doesn’t mean we won’t continue to pursue the clean green dream. Why let reality or economics get in the way of Utopia? Ah, I just love Gaia religion. Can't wait for the Spring rituals, the ones where they lay the wreath on Rachel Carson's monument. Maybe I'll burn some trash in the yard in her honor or spray a little weed killer on the damn clover. Oh, I nearly forgot this news since it's nearly a week old now. But look for the new fad this summer - flash mobs. One of the downsides to teh burgeoning social media, hmm? I already mentioned the long hot summer ahead. Seems like it may get even hotter in urban areas. It seems that a scientist from Iran who went to Saudi Arabia on a pilgrimage last June got lost on his way back home. Or maybe bad Americans kidnapped him? How come Saudi Arabia doesn't have the video tapes? He wonders if it’s a matter of timing. Western intelligence believes Iran is busy as a beaver building more nuclear sites. Thus, breaking the news now, the administration hopes to make Iran paranoid about (a) what do we know and when did we know it; (b) even more paranoid that we could get one of their scientists; and (c) this may pressure the usual foot-dragging suspects - i.e., Russia and China - to move toward a tougher stance. We can complain about the villainous Iranian government by ourselves, but it rises to a whole nother level when one of their own, now safe, nuclear scientists says, yes indeedy, Iran is being very bad. Interestingly, the CNN video doesn’t even mention Headley’s aborted plans to kill Kurt Westagaard and Fleming Rose before moving on to behead the employees of Jyllands-Posten, throwing his bloody Jihad prizes out the windows and finishing it all off by blowing himself up. As the imam says, he wasn't going to be a murderer, nor was he a murderer in helping plan for Mumbai. No, Headley was to be a martyr, busy restoring Islam's honor. So now he's squealing on his connections in exchange for his life. Some honor, Doodad. This particularly applies to Democrat National Chairman and ex-governor of Virginia, Tim Kaine. He has been burned by his ignorance in this area while serving as governor. His behavior in this endorsement of Dar al Hijrah could be considered dereliction by those willing to cut him a break. I think ex-Governor Tim "Judas" Kaine's commissions are far worse than mere dereliciton. The pedophilia scandal in the European Catholic Church continues to generate headlines. Most of the reports of abuse come from Ireland, the Netherlands, Switzerland, and Germany, and Pope Benedict XVI is implicated in an alleged failure to take action against an abusive German priest whose case was referred to the office of then-Archbishop Ratzinger. In other news, an FBI-led Joint Terrorism Task Force made raids on a Christian militia group at locations in Michigan, Ohio, and Indiana, on the basis of reports that the group threatened violence against Muslims. Meanwhile, on the Indonesian island of Java, a conference of gays and lesbians has been successfully blocked by Muslim street protests. Thanks to Barry Rubin, C. Cantoni, Fjordman, Freedom Fighter, Frontinus, Insubria, JD, KGS, Sean O’Brian, TB, and all the other tipsters who sent these in. There have been a number of recent reports about increasing attacks by Muslim immigrants against Jews in Scandinavia. The following article from the Norwegian newspaper Aftenposten focuses mainly on anti-Semitism in European countries other than Norway. The article below reports the growth of anti-Semitism in other Western European countries as well as Norway. In my view, this is a symptom not only of increased immigration, but also a sign that the Muslim communities are becoming braver and more “daring”. European Jews feel more insecure and threatened. Last year, the highest number of anti-Semitic incidents since the 2nd World War was registered. “Cancer Jew, cancer Jew!” yelled the two Moroccans loudly. Shalom Dov Ber van Halem (22) was on his way home from Sunday supper at his parents’ house in Amsterdam when two Moroccans on bicycles started shouting at him. “Cancer Jew! Hitler didn’t finish the job!” they yelled, and then went away. Van Halem continued walking, but was suddenly knocked to the ground by a heavy blow to the back. The two Moroccans had run over him. A third one came running, and all three threw themselves on top of the young man. “We hate Jews! You kill people in Gaza,” they spat at him, while kicking and beating van Halem, who suffered severe injuries. Raphaël Evers is a Rabbi in the orthodox Jewish society in Amsterdam. He says that the hate against Jews is getting worse every year. “The Jews here can never feel safe. Usually it’s racist statements being made, but many have also been attacked,” he says. According to the Dutch authorities there has been a significant rise in the number of attacks on Jews, especially during the war on Gaza last year. In most cases it was Muslim immigrants who carried them out. The situation in the Netherlands isn’t unique. Anti-racism organizations and institutions registering anti-Semitic incidents report a large increase of attacks on Jews and synagogues. Jewish children are being bullied, people are being knocked down, synagogues are smeared with racist slogans. In several cases, firebombs have been thrown against synagogues. The Jewish Agency, an organization connected with the Israeli government, wrote in a report that there were more attacks on European Jews last year than in any year since the Second World War. The report concludes that the Israeli military offensive in Gaza last year led to a wave of anti-Semitic incidents. The side curls wave in the wind when the Jewish man in a black caftan comes down Lange Kieviestraat on his bicycle. Outside the Kosher King store, two people converse loudly in Yiddish. Here in Antwerp, Belgium, around 22,000 Jews form their own community. They have their own schools, doctors and shops with kosher food. Many are Hasidic, ultra-orthodox Jews who follow the Torah strictly. Now, the community is shaken by the increasing anti-Semitism. At the Restaurant Hoffman, Mochi Hoffman serves kosher food. He acknowledges that the situation has become more difficult. “The other day, there was a football match where the fans started singing old Nazi songs,” he says. He and other Jews that Aftenposten speaks with confirm reports of increased anti-Semitism. Synagogues have been attacked, cars smashed, and walls painted with anti-Semitic statements. “We see incidents almost daily. People are scared. The higher unemployment rate has contributed to making the situation worse,” says Diane Keyser, a member of a forum connecting Jewish organizations in the city. Almost all the attacks are carried out by young immigrants from the Middle East. But Ms. Keyser emphasizes that the relationship with the many Muslims of Antwerp is mostly a good one. Antwerp is a lively Jewish society. At Restaurant Hoffmann, most of the customers speak Yiddish. Alongside Jerusalem, London and New York, this is one of the largest communities where this language is still being spoken. While many of the Jewish communities in Eastern Europe were exterminated during the war, Antwerp is often called the last shtetl, Yiddish for village. Last year the Center Against Racism in Belgium registered well over 100 attacks against Jews, twice as many as the year before. In the Netherlands, over 100 anti-Semitic attacks were carried out in January 2009 alone, more than the whole of 2008. In Great Britain, the Community Security Trust (CST) reported 924 attacks, the highest number since they started counting in 1984. France has the largest Jewish community in Western Europe, but several thousand have emigrated to Israel during the last couple of years because of the hatred against them. The French Jewish Community registered 832 incidents last year, a 100% increase compared to 2008. According to the American Pew research institute, many Europeans have a negative attitude towards Jews, especially in Spain, Poland and Russia, but also about 20% of the French population share the same view. The Jews have been living in the Netherlands for several hundred years. At the beginning of the Second World War there were 140,000 of them. 75% were killed by the Nazis. Bloeme Evers-Emden (83) survived Auschwitz. “The anti-Semitism is a lot worse now than before the war. 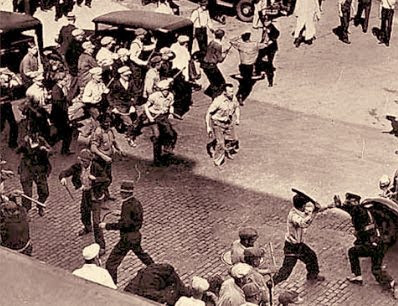 Today, Jews are attacked on a regular basis; that didn’t happen back then. The anti-Semitism has become more violent,” says the fit lady. She tells us that the Dutch Fascist Party (NSB) spread a lot of propaganda about the Jews before the war, and that Jews couldn’t hold certain jobs or join certain clubs. Rabbi Raphaël Evers says he is harassed every time he goes out. Shalom Dov Ber van Halem tells us he is the object of racist remarks almost every week. He has been beaten several times. “Sadly, anti-Semitism has become an everyday thing here in the Netherlands. People aren’t shocked anymore when they hear about such incidents. I regret that,” says the 22-year-old. Lastly, there is the question of the likely activities of ex-military personnel during conflict between HBP and MFC. At the risk of stating the obvious, it seems improbable that such folk would sit around watching the growing disorder on the television when they could be ‘contributing’ to it themselves. No longer constrained by chain of command, quite possibly full of hostility towards Muslims, certainly missing the smell of cordite in their new 9-to-5 office jobs where ‘combat’ consists of firing elastic bands at people, and with old military networks and know-how still in place, ex-military personnel are likely to flood into any organizations promising a chance to stick it to the believers on the shores of Albion itself. And there will be tens of thousands of them, many of them, one would imagine, in the police. If those in government tasked with considering these matters (as opposed to those tasked with singing the glories of our newfound diversity) are not having sleepless nights over this, then they are not doing their jobs properly. In contrast, Muslims have virtually no one in the UK with any conventional military experience. The Muslim way of war consisting largely of car bombings and throat-cuttings, and we must expect these to be the most commonly-used tactics during what is to come. However, in contrast with the strict rules of engagement that apply in Iraq and Afghanistan, tribal conflict on home soil will be a largely gloves-off affair. HBP responses to such Muslim attacks are likely to be conducted with a robust disregard for the Geneva Convention, to which MFC is not a signatory anyway. During the Troubles in Northern Ireland, the Ulster Volunteer Force (one of the two main loyalist paramilitary groups) suffered severe weapons procurement difficulties, largely as a consequence of the lack of ideological allies outside of Northern Ireland. Their attempts to procure the equipment they needed to advance their war against the IRA often foundered on the mercenary nature of international arms dealers, who would take their money then fail, in whatever fashion, to deliver the weaponry. In contrast, the IRA enjoyed two sources of genuine support in this regard during the Troubles. One nationalist, one ideological, they were the Irish-American population and the Libyan regime of Colonel Gaddafi respectively. In contrast with the difficult position of the UVF, there is a huge, gradually unfolding wave of hostility and alarm with respect to Islam not only across the whole of Europe, but also across the United States, and, perhaps to a lesser extent, Canada and Australia. Israel and India are two other countries which appear to have their own ‘issues’ with Islam, and surely contain factions who would not be averse to seeing a blow struck against it in the UK or any other European country. What this means is that intelligence, propaganda, funding, personnel exchanges and the procurement of war materiel on the part of anti-Muslim non-state actors will increasingly come to be distributed across a vast swathe of the world with massive trade and transport links, substantial cultural, historical, and racial ties, and large concentrations of educated and wealthy people. Even in Europe alone, there is already a thicket of countries with vocal anti-Islamic parties and organizations, and the stirrings and rumblings of less orthodox resistance to the ongoing process of Islamization. The almost perfect overlap of concerns, dangers, and likely responses will make the formation of international networks amongst these parties inevitable. A situation may be reached in which the difficulty facing anti-Muslim paramilitaries is not how to procure weapons, but exactly what to choose and whom to accept it from. Muslims are in a slightly different position in this regard. There are extant Muslim criminal networks in place throughout Europe, be they looser or tighter, which are already cooperating to some extent in their various criminal activities. These gangs will already have smuggling operations in place for shipping, for example, stolen cars out of Europe and weapons and drugs in. It is highly probable that they will be very heavily involved in logistical, financial, and operational aspects of the Muslim side of any widespread tribal violence that ensues in Europe. Indeed, they may well end up taking a central role, in contrast to the probable central role of ex-military, rogue military, and rogue police elements on the British side. Proselytisation efforts notwithstanding, the Muslim population in the UK still consists overwhelmingly of peoples who are ethnically foreign. Well aware of the degree of scrutiny this brings down upon them, they seem of late to have started trying to recruit people from other ethnicities. Germaine Lindsay, one of the four 7/7 bombers, was of Jamaican origin; Richard Reid, the now-infamous shoebomber, the son of an English mother and a Jamaican father; and Nicky Reilly, the failed Exeter bomber, white British. This development notwithstanding, certain regularities of appearance, name and country of origin will continue to make Muslims stand out from Europeans, particularly the most ideologically and politically important ones. In contrast, Britons determined to oppose the Islamization of their country by fair means or foul will not be physically identifiable as belonging to any group worthy of concern. Muslims in the UK can be profiled to a greater or lesser extent, but ‘profiling’ the British population of Britain will not be possible. There is only one clear disadvantage that Europeans will possess with respect to law enforcement, and it is one of the likely consequences of what one might call the unimaginability of violent or vigilante action for many of those Europeans. It is, in some sense, the reverse of the culturally sealed nature of the Muslim community, as outlined above. It is, of course, a great thing to live in a country in which the rule of law obtains, and in which the authorities do, on the whole, a good job of maintaining law and order, helping people to live in peace and prosperity. But one of the consequences of this is that any sort of vigilante action becomes borderline inconceivable for the overwhelming majority of the population. ‘They’, the authorities, the government, the people upstairs, will always take care of any problem, even when it is clear that ‘they’ created the problem in the name of their social engineering goals, that ‘they’ are not about to admit their own culpability, and that ‘they’ are willing to identify their own people as the source of all difficulties and act accordingly if that is what it takes to try and control the situation. There is a second advantage for MFC in this regard. The high barriers to vigilante violence among HBP will not only reduce the fraction of them prepared to engage in such violence, it is also likely to increase their unease at the idea of others amongst them engaging in it, and therefore the probability of them informing on those of their fellow Britons who do. This is a subtle point, and one upon which there will be legitimate disagreement. Let us consider the issue from the Muslim perspective. The general hostility that many Muslims in the UK feel to their host country is well known to even the most casual observer of these matters. Though this hostility has many unfortunate effects, the one that is most obviously relevant to the discussion here is the larger margin for error that it will grant to Muslims interested in planning and carrying out some sort of terrorist on British soil. One of the critical moments for any type of would-be terrorist organization is surely that moment at which it approaches a potential recruit and asks him (it probably will be a him) whether he is interested in joining. How exactly the offer is phrased is undoubtedly a matter of personal taste, but the key point here is that there must be some point at which a line is crossed, and at which it is conveyed to the potential recruit that the recruiter is a member of a terrorist organization. There is no one way of guessing what the likelihood of such an offer being accepted is. But if it is not accepted, what happens then? Of course, the side making the offer is likely to simply let the matter drop there, perhaps pretending that it was only made in jest or that the party they attempted to recruit misunderstood their intentions. But the side receiving the offer is now faced with a choice of sorts: to inform the authorities or keep their new knowledge about the affiliations of their acquaintance to themselves. What then, is the probability of them deciding on the former? Again, there is no way of providing a definitive answer to this question, but it seems reasonable to suppose that many Muslims will refrain from informing on other Muslims involved in terrorist activities, especially given that opinion polls conducted in the UK have suggested that it is so. If this speculation is correct, it constitutes a big handicap for the security services trying to infiltrate such groups, all other things being equal. Muslims guerillas may well be able to swim in the sea of MFC more easily than their British counterparts can swim amongst HBP. Whether this will actually prove to be the case is an empirical question that cannot yet be answered with confidence. I suggested above that the ability of the security forces to keep a lid on rapidly escalating MFC-HBP violence would be extremely limited. Of course, one could argue that this would work to the advantage of Muslims just as much as to the advantage of Europeans, but there is an important reason why this is not so. I am no authority on the ins and outs of intelligence work vis-à-vis Muslim communities in Europe, but one thing is passably clear from the very small number of successful attacks and very large number of disrupted terrorist plots: Muslim communities in Europe must be riddled with security service assets and/or severely compromised with respect to investigation in other regards. There is simply no other way that so many plots could be disrupted. Not all Muslim would-be terrorists are stupid enough to try and buy ten gallons of hydrogen peroxide from a hairdresser. Clearly, this degree of infiltration is not something that can be obtained overnight, or without a substantial investment of time, money, manpower, and political capital. To rephrase, the security services must have already sunk a great deal of their available operational capital in infiltrating MFC, and this investment is one of extremely low liquidity. They cannot cash in an asset in Hizb ut-Tahrir’s UK branch and use the proceeds to buy an equivalent asset in the (presumably) fictional Albion Liberation Front. 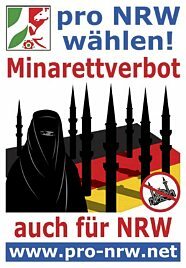 If they wish to similarly infiltrate the loosely-knit web of European anti-Muslim paramilitary groups that will, I predict, emerge in the years to come, they would have to start almost entirely from scratch except insofar as such groups are part of the conventional extreme right, which is undoubtedly already infiltrated to some extent. What this means is that the MFC would be likely to both constitute and remain a much more heavily infiltrated and therefore compromised community than its enemy, HBP, in the event of the outbreak of mutually inflicted tribal violence. It is to be observed that virtually all paramilitary organizations have operational constraints imposed upon them by the amount and type of violence that their supporting populations are prepared to tolerate. Even an organization as ruthless and unconcerned with civilian casualties as Al-Qaeda eventually ran into trouble for the massive civilian casualties it inflicted in Iraq, on Sunnis, Shias, men, women, and children. Other, more restrained organizations (such as the IRA) took trouble, at least some of the time, to choose non-civilian targets, to give warnings shortly before bombs were to detonate to facilitate evacuation of the relevant areas, and so on. In the event of serious hostilities between HBP and MFC in the UK, British paramilitaries will have to consider their targets carefully so as not to lose political and other types of support. It would be futile to try and examine this matter in detail, as the political state of play in such a scenario cannot be predicted. However, there is one observation that can already be made with confidence, and that is that Britain is already a target-rich environment for those who would target Muslim actors without bringing an unacceptable degree of opprobrium down on their hands, even in the initial stages of conflict before polarization was complete. Let me be more explicit, and provisionally divide potential Muslim targets up into three categories, in order of decreasing whackability (my apologies for the technical language). Beneath Category 3 we would have unobjectionable and blameless Muslim civilians, violence against whom would overwhelmingly be condemned by the British people at least in the early stages of conflict. Of course, if the conflict became unpleasant enough, violence against random Muslims might be supported. But that is another matter. The significance of the above lies in the fact that British anti-Muslim paramilitaries could liberally hack away at certain parts of the MFC without particular concern over the possibility of a damaging PR backlash. Category 1 Muslims will earn little sympathy irrespective of what happens to them, and Category 2 Muslims perhaps not a great deal more. Whacking Category 3 Muslims or below could start to cause problems, but staying away from them will keep violence within a zone that will not start to dangerously compromise support for the paramilitary group in question. Those who are unclear on this point should research, for example, the difference between the Warrenpoint bombings (when the IRA succeeded in killing 18 members of the British Army) and the Enniskillen bombings (when they succeeded in killing one off-duty policeman and ten civilians, massively to their own detriment). HBP paramilitaries will therefore have myriad opportunities to polarize relations between HBP and MFC in the UK and take the situation beyond the point of no return, without incurring the opprobrium directed at those who kill innocent civilians. Furthermore, there are so many targets that they could continue to focus on them even if MFC started to engage in random sectarian killings in response. The response of the British state to such killings on the part of MFC would probably be more than sufficient to deal with such a development. If MFC wishes to retaliate, it will have to do so via random killings and bombings as mentioned in the previous paragraph because it has no equivalent targets. The only targets they will have that will not bring the hostility of the entire British people and establishment down on their heads will be each other. If I were a Muslim trying to construct my own list of targets equivalent to the above, who would I put on it? The Conservative Party? UKIP? The BNP? The Centre for Social Cohesion and Douglas Murray? The police? The EDL? Prominent critics of Islam? Salman Rushdie? Campaigners against Islam, like SIOE and its leader, Steven Gash? Lord Pearson and Baroness Cox, who invited one Geert Wilders to the House of Lords? Any attack, successful or otherwise, on any of these targets (including the BNP), would repel and outrage the entire country. MFC will have no ‘elbow room’ in this regard. The last great advantage that HBP will have over MFC in the event of major hostilities between them is that HBP will have open to them formal and informal objectives both legitimate and plausible, whereas this will be much less true for MFC. Let us consider this important point in detail. MFC is a very recent graft, a graft that has been inflicted on HBP without their consent, and through the perfidy and treason of their political class. Its roots in the UK are shallow, and its disproportionately criminal, parasitic, seditious, terrorist, and ideologically hostile and subversive nature make those roots much shallower in effect than those of, say, the Hindus, whose history in the UK is of essentially the same length. Very few British people would walk down a street full of Pakistanis, or Somalis, or Algerians and feel in any meaningful way that the people around them were now ‘just a part’ of the British people. No good thing that exists in the UK, not one, exists because Muslims in the UK created it. In contrast, and at the risk of stating the extremely obvious, the British people have been in Britain rather a long time. Moreover, every good thing that exists in Britain exists because, and only because, they created it. As a consequence there is no meaningful claim that Muslims can make to Britain, anything in it or a single square inch of its territory. Contrast this with, for example, the centuries-long presence of the Protestant British settlers in Northern Ireland. Whatever one’s take on Irish history, it can hardly be argued that they are some blip within it, and even the IRA never argued against the presence of these Protestants in what they would call the Six Counties. Rather, they argued against the political authority of the British state in Ireland, and for the creation of a united Ireland with substantial regional autonomy enjoyed by its component parts. Now, it is my contention that the British can argue in favour of a relatively Muslim-free Britain, and against the presence of any substantial numbers of believing Muslims in their country at all. Even failing that, they can argue against further Muslim immigration, for the deportation of Muslims without British citizenship, for the deportation of criminal Muslims, for the deportation of sharia and jihad-supporters, for the withdrawal of benefits from Muslims, and so on. Many would think these political objectives are hopelessly implausible, but I feel we are not that far away from seeing them enter the political mainstream in more and more European countries, as they have already started to do in the Netherlands. Either way, they are real, concrete objectives that are all physically plausible and will all eventually be demanded. MFC has no such equivalent goals. They cannot demand the deportation of Britons, reduced immigration of Britons, fewer Britons sucking tax revenues out of them, or the like, because these demands are all meaningless. They cannot even demand partition and independence, as it could not possibly be granted. They would not be economically viable, their Muslim territory would simply be besieged, savaged, and destroyed by the non-state actors already in the conflict, and any members of the government trying to grant independence would be swinging from lamp-posts by the end of the day. Besides, what would we give them? The North of England? No, partition is clearly inconceivable. The only meaningful demands Muslims could make would be for more of the same: more immigration, more money, more appeasement and more sharia. But of course, it will have been precisely these things that will have precipitated violent conflict in the first place, so such conflict would only be further inflamed by granting more. Of course, Muslims being Muslims, there will be the usual maniacs who think they can beat the whole of Britain in a civil war and somehow benefit from it. But in reality, the increasingly precarious status of Muslims in Europe, already clearly visible at a psychological level, will only increase massively when real conflict breaks out. Muslims will then have no good options left to them. They may demand protection, but there is not much more they can ask for. What this means is that there is no obvious way the British government can ‘break’ in favour of MFC, but many ways it can do so in favour of HBP. Concessions are likely to be granted in one direction only when things start to disintegrate. The Congressional Budget Office estimates that within ten years, the US budget deficit will rise to 90% of GDP. By that time the federal public debt will amount to $170,000 per household. In other news, illegal immigrants from Eastern Europe who are camped along the River Nene in England are catching, killing, butchering, and eating the river’s swans. The immigrants live in shanties made of plywood and tarpaper along the river, and are depleting the river’s stocks of fish as well as the swans. Meanwhile, a curio dealer in Montreal is trying to sell what he claims is a bar of soap made from WW2 Holocaust victims. Also, Dutch police are being given special training that will teach them to respect gangs of “youths”. Thanks to C. Cantoni, Escape Velocity, Freedom Fighter, Gaia, Insubria, JD, KGS, Steen, TB, Vlad Tepes, and all the other tipsters who sent these in. With his plea for a ban on the headscarf, PVV-leader Geert Wilders shows that he himself is “the chief oppressor of the Islamic woman,” according to the Turkish-Dutch State Secretary (Justice Ministry) Nebahat Albayrak [PvdA, Labour Party, Socialists] in an interview with de Volkskrant (paper edition). “If my mother had not been able to work with her headscarf, I had never become who I am,” Albayrak said, who was born in Turkey. “We owe the emancipation process in our family to a mother who had contact in the meat processing industry with the outside world and earned her own money.” This week Albayrak decided she wants to become a parliamentarian again for the PvdA. Wilders is not impressed with her comments. “Albayrak, as owner of a Turkish passport, should have known better: Even many official Turkish bodies and institutions ban the headscarf. She lost it a bit with her two passports. Moreover, the Islamic headscarf is a symbol of oppression of woman, ergo: of the backward Islamic culture,” Wilders said in a response. Albayrak also says in the interview that she is “pleasantly surprised” with the statements of the business union frontman Bernard Wientjes about Wilders. The chairman of employers’ organization VNO-NCW warned publicly last week of the damage caused to the reputation of Netherlands abroad by Wilders and his PVV. On the threat against the indigenous Armenians in Turkey by Erdogan however, they remained silent. In an open letter in De Volkskrant [printed edition] some former ministers and other (former) politicians take a stand against Wilders and other “populist preachers of hate and fear” which have mainly targeted immigrants and in particular Muslims. “The naming of hatred of foreigners should not be a taboo. The fear of the verbal violence of fear and hate-mongers must not take us hostage. Therefore we speak loud and clear against discrimination and racism and for solidarity regardless of ethnic origin and religion,” the signatories state. Among them are the InterNazi René Danen, chairman of Netherlands Admits Color (Nederland Bekent Kleur) and the Moroccan refugee-immigrant and Muslim Marxist, Mohamed Rabbae (GreenLeft, International Socialists) who has always pushed to ban [pdf] the book “The Downfall of the Netherlands” and called Geert Wilders “A little Hitler”. The Netherlands is a beautiful country. A civilized country, thanks to the — up to now widely represented in the population — sense of social justice. Equality for all citizens is laid down in the first article of our Constitution and the Convention on Civil Rights of the United Nations. Thanks to the deep-rooted tradition of tolerance and respect for diversity, religious and ethnic minorities could until now take their fully-fledged position. This internal openness has always been a strong basis for the international openness of the Netherlands. Up to now the Netherlands has compelled respect in the world. These important characteristics are threatened by populist preachers of hate and fear. They want to change the Netherlands into an intolerant country, a cultural humdrum, cleansed of “non-Western” ethnic, religious and cultural elements. With their policy of “we” against “them” they put citizens against each other and with their advocacy of racism and discrimination based on religion and descent, they squeeze minorities in a corner. Immigrants and especially Muslims must suffer. They would not be allowed to have their own schools, not allowed to build mosques, and not allowed to become minister or state secretary. And women are deprived of their right to wear a headscarf. Not Muslims, but the radical right-wing politicians are “Islamizing” the political debate and social life in the Netherlands, reducing every problem — from traffic jams to housing and crime — to a matter of religion. The actual socio-economic problems that disproportionately affect ethnic minorities, have disappeared from the political debate and been replaced by an ideology of “conflicting cultures”. All too often the preachers of fear and hate hide behind the freedom of expression. The respecting of that freedom does not relieve us of the obligation to publicly take a stand against the abominable hatred of foreigners and to protect minorities against discrimination and racism. Too few citizens, intellectuals and politicians speak out against the discrimination under the guise of “religious critique”. The populists want to abolish Article 1 of the Constitution [on discrimination], advocate “slamming shut the borders to all non-Western immigrants” and want to deport “tens of millions” of European Muslims. Also the call for a “major cleaning of our streets”, to start with the introduction of a “head-rag tax”, affects the dignity of Muslims and undermines the democratic principles of the Netherlands. A powerful counter-voice is heard too little. The naming of foreigner-hatred must not become a taboo. Note: They try to avoid the word “xenophobia” and suggest that they quote, but without reference. They also talk of “they” while it is clear who they are aiming at. [March 18, 2010] Angered at the Armenian “genocide” resolutions passed by a U.S. House of Representatives committee and the Swedish parliament, Turkey’s prime minister says he is prepared to deport 100,000 Armenians living illegally in Turkey if necessary. Turkish Prime Minister Recep Tayyip Erdoðan made the following remark in an interview with the BBC’s Turkish Service during a visit to London a few days ago: “Look, there are 170,000 Armenians in my country; 70,000 are my citizens. But we are not making a fuss over the remaining 100,000. So what will I do tomorrow? If necessary, I am going to tell these 100,000, ‘come on, back to your country.’ I will do this. Why? Because they are not my citizens. There is nothing that forces me to keep them in my country.” […] Ergun Babahan of daily Star went the whole way and wrote [in a comment], “If Hitler had been Turkish, we would also be denying the Holocaust today.” He added, in so many words, that that the spirit of Enver Pasha and his “Ittihadists” was alive and kicking in today’s Turkey. [March 19, 2010] The Turkish Prime Minister Erdogan has at a meeting in Istanbul called 1500 Turkish politicians who are active in Europe [politicians in European countries] not to integrate into the country they live, but just to become politically more active. This is reported by the German weekly Der Spiegel [“Erdogan umgarnt deutsch-türkische Politiker”], which relies on statements by Turkish politicians living in Germany. Some1,500 Turkish politicians, mainly from Germany [there is an investigation ongoing in which Dutch politicians were present], have last month at the invitation and expense of the Turkish government attended a conference in Istanbul and stayed in a five star hotel. [March 18, 2010] The Turkish government wants to provide a limited guarantee of immunity to the by authorities appointed religious Imams. A bill in Parliament provides that imams can only be sued with the consent of the highest authorities. The new law would restrict the possibility to legally prosecute scholars for their political statements. The draft law on the duties of the Turkish administration for religious affairs (Diyanet) provides that its director comes directly under the Prime Minister and reports to him. […] Turkey follows the principle of separation of church and state, which was ordained by the founder of the republic, Mustafa Kemal Atatürk. In practice this means that the Turkish state controls the religion. The opposition however, accuses the Islamic-conservative government of Prime Minister Recep Tayyip Erdogan of seeking to Islamize Turkey.